As you’ve noticed, I don’t do a lot of shows and I don’t write a lot of blog posts! But 2019 is the year that will change… a little. I won’t suddenly blast your inbox full of announcements but I will do more than I have in years past. I’m making LOADS of fun and beautiful new necklaces, earrings and bracelets, and I am so eager to share it with all of you. First up — Sip. Shop. Love. 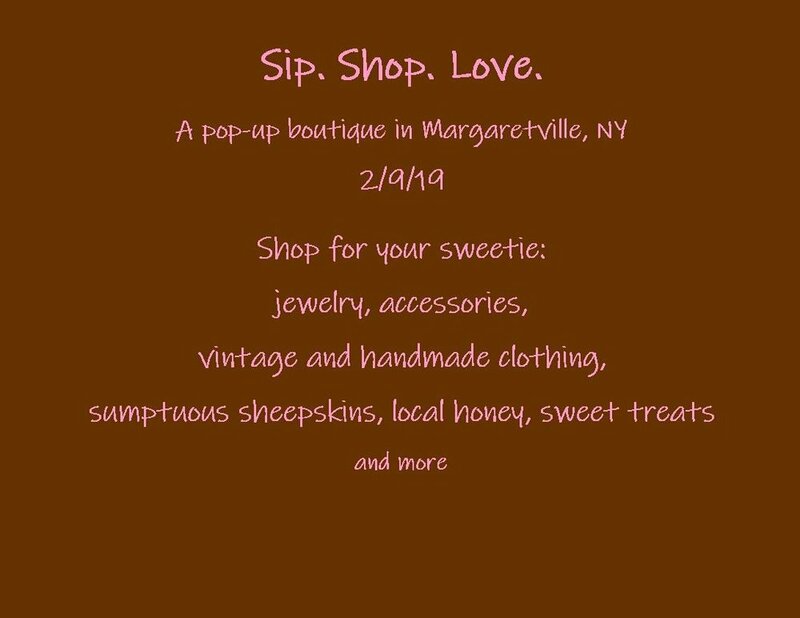 is a pop-up boutique that I am hosting at the Margaretville Telephone Company’s 61 Academy Street location. Formerly the parish hall of the church across the street, it is a lovely space — open and airy with a high ceiling and tons of natural light. Harry and the Hippie Chick will have her hand warmers, hats, and sweaters as well as her carefully selected and truly spectacular collection of vintage clothing. Do you adore Stephanie Charlene’s pottery? You’re in good company! We’ll have a sweet selection of Stephanie’s latest. What Valentine’s Day boutique would be complete without honey for your honey? The Roger’s Ranch will have honey, candles and luscious lip balm. How about a sumptuous sheepskin? Evans and Evans (AKA Mr. and Mrs. Sheepfarmer) will be showing off their gorgeous wares - perfect for so many uses! Steve Burnett, known to many as Bovina Farmer, creates visual stories in metal. These heart-themed sculptures will make your sweetie swoon. Lisa Scalf of Handmade With Love will be showcasing her gorgeous handmade clothing, shoulder bags, and other treasures. Check haliagrace’s posts on instagram and Facebook for updates and buzz-building! Sip. Shop. Love is going to be exactly what February in the Catskills needs! Bovina Open Barn and Studio Day! On Saturday, August 19, haliagrace handmade jewelry will open it's doors -- quite literally - welcoming the public in to check out my studio. Sure, I'm a tad nervous about where I'll stash all the dogs and how I'll make this all work, but it will be fun and fabulous. Check out this ADORABLE short video starring my dog, Hawkitt, promoting the open studio tour. Snacks will be provided by Catskills Regional Harvest and the studio will be open from 10 a.m. to 4 p.m. It has been too long since my last post and while excuses are a dime a dozen, I really do have a good one: we moved! The hubby and the dogs and I moved from the one room shack to the gorgeous but unfinished barn-home that we are lovingly and SLOWLY completing. My studio is much more finished, and roomier than the hallway I squashed myself into last year... but at least in that space I knew where everything was. Here... it's a challenge: is that tool in storage, in the old studio, or on the shelf behind me? Who knows? But with a little elbow grease and some shockingly luscious red paint (yes, I painted one wall of the studio a rich lipstick red -- and the local hummingbirds have been knocking on the windows ever since! ), this studio is functional and beautiful and very much in use. So what am I making? Earrings, bracelets, and necklaces, focusing on two main themes: one is organic simplicity and the aquamarine and citrine necklaces really show this off beautifully. Sterling silver chain, and water clear nuggets, tumbled smooth. These are eminently wearable pieces. And I am testing out a new supplier and a new direction: RUST! Rusted metal pendants, made in Colorado and each one more compelling than the last. Looking forward to filling Facebook and instagram with the photos as these get finished. Always check the facebook page first for the latest in haliagrace doings and updates. And hopefully next time I post, I'll have filled the nail holes and painted the closet. Did the fall fly by for you too? Here in the western Catskills it was a glorious autumn, with foliage colors rivaling the best I've ever seen. Late fall is dominated by steely gray skies and rusty brown leaves - the oaks and beeches are the last to let go of their now-ruddy summerwear. Views open up and snowy dustings reveal wildlife comings and goings. We're headed into my season: winter is when I shine. I love everything about winter, including the long dark hours of creating new haliagrace pieces by the fire. November 12 and 13 -- The Craftskills! All day both weekend days in hip-swinging-groovy Bovina Center, NY, two floors of local makers, farm fresh food products, and scrumptious lunch! Details at The Craftskills website or on The Craftskills facebook event. November 26 -- Open House and Studio at Haliagrace Handmade! Jewelry and house-building! What an eftastic combination! Make the journey out to Bovina Center, NY to see first hand what complete looney tunes Tom and I really are. There will be snacks, beverages, jewelry for sale, and house tours. 1 pm to 4 pm, Saturday, November 26. December 3 - Roxbury Arts Group's Holiday Arts Market! Another Delaware County gem of an event, RAG in Roxbury, NY hosts a curated market featuring the best of local makers and their products. Find details at RAG's facebook page. This year, to add to the holiday madness, I broke my wrist and am in a cast! Stop by The Craftskills to sign my cast and chuckle at the curve balls life tosses in our paths -- or blasts like a fastball right at our heads. Duck, laugh, and keep on truckin'! See you soon! It's been a hot and humid summer in the Catskills, replete with deer flies large enough to carry off livestock and small children. Summer at higher elevations, like haliagrace's beloved Bramley Mountain home, is a short and intense affair. It gets hot, everything blooms, and then BLAMMO, it's cold and we're all breathing a sigh of relief as we haul firewood. Today's high is forecast to be in the mid 60s and I am almost dancing with delight. This is my kind of August day. September 4 -- the West Kortright Centre's Fair! haliagrace was psyched to be invited to set up shop at this wonderful country fair. Music and food all day; $5 entrance fee. West Kortright Centre is deep in Delaware County, NY in a gorgeous spot near Bloomville and East Meredith. November 12 & 13 -- The Craftskills! This is a yearly show, and each year it just gets better and better. Local all the way, with the proceeds of this year's Craftskills going towards the formation of the Bovina Area Arts Colony, this event is your one stop for a great day - scrumptious food, gorgeous crafts, all made right here in the Bovina environs! Located at the Community Hall in Bovina Center, NY. Thanksgiving Weekend -- Open House and Studio at haliagrace handmade jewelry! As you may have heard, we're building a new home here on Bramley Mountain, and by November we think we'll be far enough along to open our doors to the public for a day. Come see what happens when two creative wackos design a house to share with a jewelry studio and a pack of rescue dogs! Energy efficient building design meets barn aesthetics and salvaged materials in the most exciting and eclectic mash-up you ever met. And what a great backdrop for haliagrace handmade jewelry! There will be snacks, house tours, and lots of barking! See you soon! And stay cool! The Delhi Farmer's Market is a thriving and bounteous affair, with a healthy handful of the best fruit and veggies growers in the region hawking their gems. In addition, Oakworks Studio offers silky smooth wooden creations (cutting boards and spreaders as well as other functional art pieces) and unique handmade jewelry, and Little Delaware Pottery is there with soda fired porcelain and stoneware (LDP is the maker of the Mica mugs). And now -- TA DA - haliagrace handmade jewelry will also be there, with eftastic earrings, bracelets, and necklaces! Look for the chocolate eft with raspberry sprinkles (on the banner, but hey, maybe one day we could make that happen for real! ), and come say hi. There will be weekly specials for sure! Wednesdays, July 2016: 9 a.m. to 2 p.m.
What retailer worth her salt wouldn't offer a Memorial Day sale? Earrings, necklaces, bracelets -- old and new -- all at special savings! Mailing list subscribers get a sneak peek later today, before the sale goes public 9 a.m. Monday May 30. This is all happening at the haliagrace etsy store; use the coupon code MEMDAY2016 starting at 9 a.m. tomorrow morning. It's a hot weekend here in the Catskills and we're all feeling a bit clobbered by the heat and humidity. Early morning and evening hours are the only times I can function so it's off to the photo booth (AKA my kitchen table) to photograph the new earrings and bracelets I sweltered over yesterday. Happy Ka-BAM into summer, and may your Memorial Day weekend be full of gems! Check your inbox for that newsletter with photos of the new stuff, sale details, and a goofy selfie (of the dogs, not me! ).